Around three or four times a year, many students at Littleton are rewarded with a certificate, and recognized as a certain IB character trait. The spring recognition celebration consisted of students who can be identified as communicators, risk takers, or open-minded. 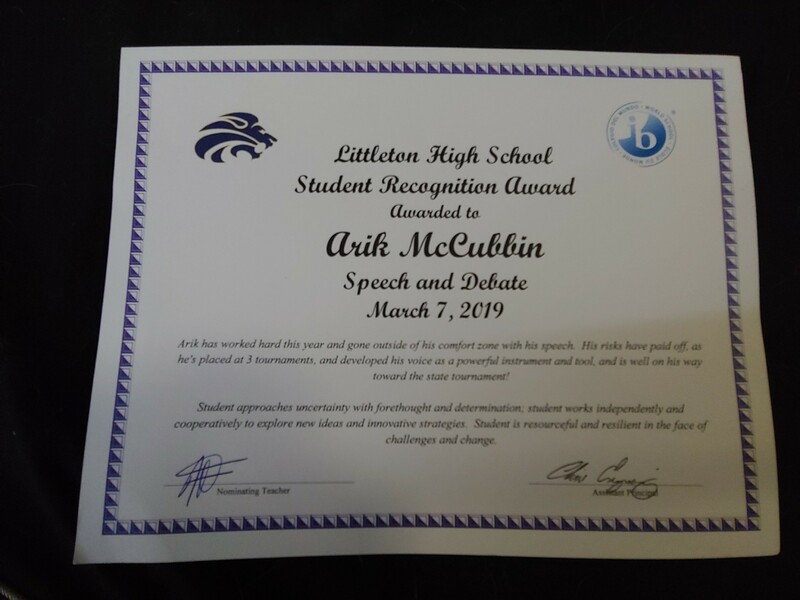 Senior Arik McCubbin was recognized in the risk-taking category for his involvement in Speech and Debate. After two years of participating in the Original Oratory event, McCubbin is able to attend Speech and Debate State. “I think that this nomination was accurate because in every event you participate in for Speech and Debate, there’s something new that you are representing to someone who has never what you have to say before. This means that you have to take the risk of going in almost blind, and walking out with a mindset that you still portrayed what you wanted to say properly,” said McCubbin. Part of the Original Oratory event consists of the student intending to inform and persuade the audience about a specific topic, usually one involving a social or political topic, according to the National Speech and Debate Association. Arik McCubbin’s piece describes how people should tear the metaphoric wall down that highlights their differences, and instead value our individuality and move onward as a society. These IB learner trait awards are given to students who excel in the category they were chosen for. Participating in Speech and Debate is a risk to take, but for McCubbin, he took the risk and prevailed.